Roan is an enslaved gladiator, half-blooded descendent of an ancient and mystical race that was driven to the brink of extinction by humans. He is freed from his captivity by a mysterious young heroine named Dara in exchange for his help in tracking down the last full-blooded member of his kind. Roan follows Dara back to Turien to keep an Ancient device out of the hands of those who would use it for evil. There they find an army has risen up out of the earth and the sea to attack the city state, leaving death and destruction in its wake. Tension mounts as each member of the company finds their loyalties shifting, their secrets exposed, their questions unanswered. Who is Auhle, why is he after the device, and what does an old hermit cast out of the Watchers' society have to do with it? Dara has disappeared in a fit of uncontrolled rage. Now she has to learn to rein in the power in her Ancient Blood before it burns her from the inside out while Caspian, Mac, and Roan attempt to locate her from across the continent. Elnor takes a detour to check in with her boss and to serve a side of blackmail on an all-too-deserving target. All roads lead to Eldendore, a city-state plagued by years of bigotry and intolerance of the Ancient Blood. Rebellion threatens to spill into the streets even before Roan arrives. Tentative new friendships are formed and immediately tested in the midst of chaos. While fighting their way out of yet another city, the company is once again forced to question Auhle’s intentions in stealing the ancient artifact that the Watchers are after. No one knows how to help Dara control the power running through her veins. If she can't tame the raw energy of the Ancient Blood, it will burn her out. Auhle is her last resort. But he is up to something, and like everyone else, he's got a price—one that Dara isn't sure she's willing to pay. Caspian, Mac, Roan, Elnor and Jaem race back to Kaleb’s desert lab for answers, only to find that they are too late. Now they have to convince the enemy of their enemy to be friends. They try to enlist the dysfunctional Watcher Society to unite against the threat posed by Auhle. Even then, no one knows if their numbers will be enough to stand against the black army under Auhle's command. All converge upon the Airen Islands and an abandoned Temple of the Ancients for the final battle to decide the future of humanity and the Ancient Blood. Round Table Comics' adaptation of the supreme law of the United States of America, created by the team at Round Table Companies, includes 100% of the original text from the Constitution as well as a narrative to communicate the concepts from one of history's most important documents. Full color illustration throughout combines an entertaining read with the factual accuracy that readers of history expect. Based on dozens of intensive interviews with parents, clinical psychologists, teachers, and more, Melting Down is the fictional story of Benjamin, a boy diagnosed with Asperger’s disorder and additional challenging behavior. From the time Benjamin is a toddler, he knows he is different: he doesn’t understand social and emotional cues, does not know how to play with his sister or other children, and dislikes making eye contact. And his tantrums are not like normal tantrums; they’re meltdowns that will eventually make regular schooling—and day-to-day life—impossible. Told from Benjamin’s perspective, Melting Down gives a unique glimpse into the journey taken by children with Asperger’s disorder and additional challenging behavior, demonstrating that the path toward hope isn’t simple—but with the right tools and teammates, it’s possible. Based on dozens of intensive interviews with parents, clinical psychologists, teachers, and speech and occupational therapists, Incredible Adam is the illustrated fictional story of Adam, a boy diagnosed with autism spectrum disorder. The story follows a social narrative format to depict a typical day in Adam's life within his therapeutic residential school. From the time Adam wakes to the hour he sleeps again, his day presents him with successes to experience and challenges to overcome. With the support of his caregivers and family, he is able to use tools he's learned to help with attention, engagement, and regulation of his behavior. Offering unique insight and understanding into the journey taken by lower skilled children with autism spectrum disorder, Incredible Adam offers parents, caregivers, teachers, and therapists a special tool to help the children in their lives. When Max was four, he was diagnosed with something called PDD-NOS—pervasive developmental disorder, not otherwise specified. His parents thought the news couldn’t get any worse. But six years later, Max was rediagnosed with autism. He is low functioning and barely verbal, and when he becomes frustrated or overwhelmed—which happens often—he hurts himself or others. For his younger brother, Justin, this can be hard to understand. But Justin loves his brother and wants to understand him better. 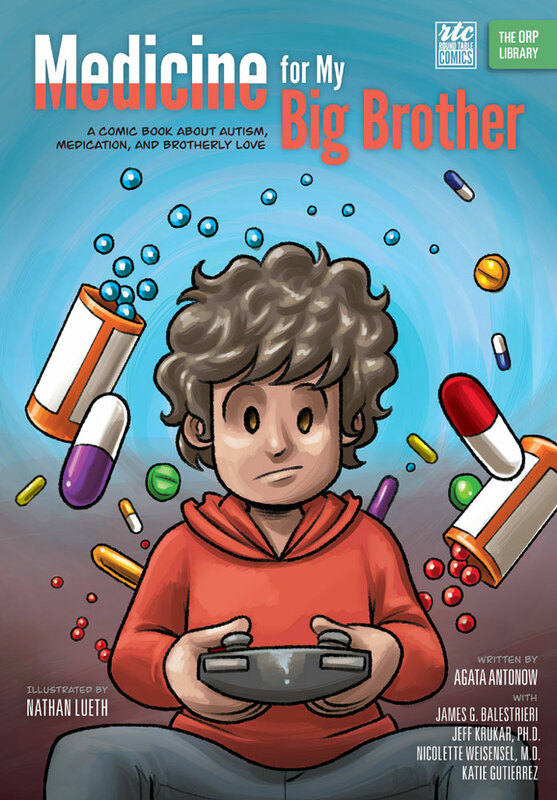 Written with children in mind, Medicine for My Big Brother explores the impact of autism from a sibling’s perspective, especially focusing on the use and effects of psychotropic medication. Based on dozens of intensive interviews with parents and clinicians, Medicine for My Big Brother is the story of a modern struggle with a universal theme: a brother’s love.